This summer salad features delightfully crunchy quinoa and sweet corn kernels in a tangy dressing. Never tried quinoa? It’s similar to millet; look for it in the bulk section of your local natural foods store. We used red quinoa for this recipe, but other colors are available. 1. Combine rinsed quinoa, salt, and 1 1/2 cups water in a small saucepan over high heat. Bring to a boil; cover and reduce heat. Let quinoa simmer until all the water is absorbed (about 20 minutes). Remove from heat. After about 10 minutes, “fluff” the quinoa with a fork by lightly stirring. 2. 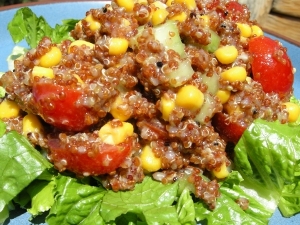 In a large bowl, combine the cooked quinoa with the corn kernels, diced cucumbers, and tomatoes. 3. Whisk all the dressing ingredients together, and stir into the salad. 4. Arrange romaine ribbons on plates. Scoop quinoa salad on top. Thanks to Living Tree Community Foods for providing this recipe. The inspiration for this soup comes from several sources, including an excellent booklet, Nature’s Healing Grasses. It was written some 30 years ago by H.E. Kirschner, a physician who healed people afflicted with serious illness by putting them on a simple regimen: They would prepare a “green drink” at least once a day. It consisted of several greens, including “weeds” like malva, purslane, and lambs-quarters, as well as cultivated greens like parsley, placed in a blender and blended with pineapple juice. Put the mixture into a blender. Add spring water or freshly made carrot juice. If you want to supercharge the drink, add a handful of wheatgrass. Blend into a thick, smooth “soup.” Serve immediately. Variations: Grind some flax, sesame, sunflower, pumpkin, or chia seeds in a seed mill or coffee grinder and toss it in, or add a chopped apple. Sue named this salad in honor of her Wisconsin garden, which produced not only a healthy crop of mosquitoes, but also red and green peppers and yellow squash. Mix dressing ingredients and apply to combined chopped vegetables, or use your favorite bottled dressing (Newman’s Own Balsamic Vinaigrette is a good one to try).